The children design and make clay beads, and then string them into necklaces. For ages 9 to 13. Plan 4 sessions. Click here for more information about working with clay. 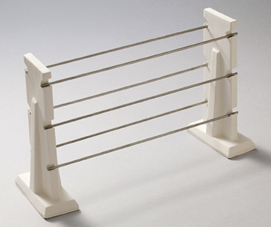 Bead rack with six ten-inch wires. Set out clay, finishing nails, and clay knives. 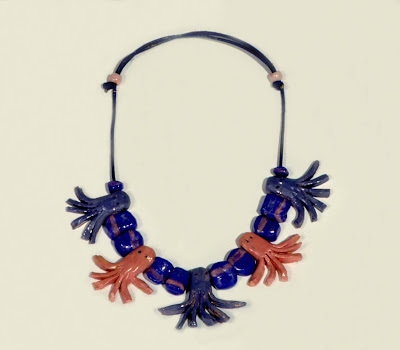 Explain to the children that in the next several sessions they will be designing and making clay beads for necklaces. To hold the beads while they are drying and being bisque-fired in the kiln, show the children how to make simple bowls. Break off a piece of clay from the grapefruit-sized ball and pinch it into a shallow bowl just large enough to hold the beads. The children can carve their names on the bottoms of the bowls using the finishing nails. Demonstrate how to make the beads: roll coils of clay and cut them into sections to make cylindrical beads; flatten the cut sections on all sides to make square beads; roll round balls of clay and flatten them slightly to make lentil beads. 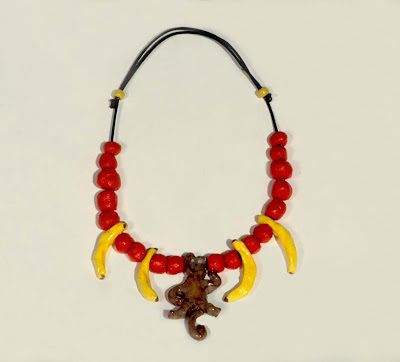 Beads such as the monkey in the necklace above will sit better if flattened on the bottom side. Explain that the beads should have a theme, or unifying idea, and that varying the sizes of the beads and repeating shapes will create more interesting designs. To make holes for stringing the beads, pass a finishing nail through the bead and pull it out the other side. (Poking the bead and removing the nail from the same side will clog up the hole with bits of clay.) If the bead is to lay flat, be sure the hole runs parallel, or in the same direction, to the flattened surface. Smooth the rough edges, being careful that the bits of clay do not fall back into the hole. After the children make their bowls, have them design and make their beads. Note: Store the beads in the clay bowls and cover with plastic. Gradually loosen the plastic to dry the clay slowly. When they are completely dried, bisque-fire the beads in the bowls. Set out the bisque-fired beads in the bowls. Set out colored underglazes, brushes, and sandpaper. Explain that in this session the children will be adding color to their beads with underglazes or clay paint. Before applying the underglazes, lightly sand any rough edges on the beads. Demonstrate how to apply the underglazes. With the brush at the edge of the hole, stroke away from the hole to avoid filling it with underglaze. Since the bisque-fired clay is very porous, the underglazes will dry quickly, allowing for designs to be painted directly on top. Have the children apply underglaze to their beads, reminding them to plan balanced or symmetrical designs by repeating colors and patterns. When the underglaze dries, store the beads in the bowls. Note: Clear glaze can be applied directly over dried underglazes, however, it is easier for the children to work with the glaze if the beads have been low-fired again. Set out dried or bisque-fired beads. Tell the children that they will be applying a clear glaze to the beads to give them a hard protective surface. Explain that the glaze will look transparent when it is first applied and then become opaque after it dries. When fired in the kiln, the glaze will melt and turn clear again, allowing the colors to show through. Be sure the children understand that when the glaze melts, it becomes sticky and attaches itself to the surface. Therefore, they need to avoid getting any glaze inside of the holes which will cause the beads to stick to the wires on the bead racks. Show the children how to avoid getting glaze in the holes by painting around the edges and brushing away from the holes. Have the children apply one coat of glaze to the beads. Note: When the beads are dry, put them on the wires of the bead rack, being sure that none of them are touching, and glaze fire them in a kiln. The beads can then be returned to the bowls for the next session. Set out the glaze-fired beads. Set out the stringing cord, plastic beads, and scissors. Explain that in this session the children will be arranging and stringing their beads. 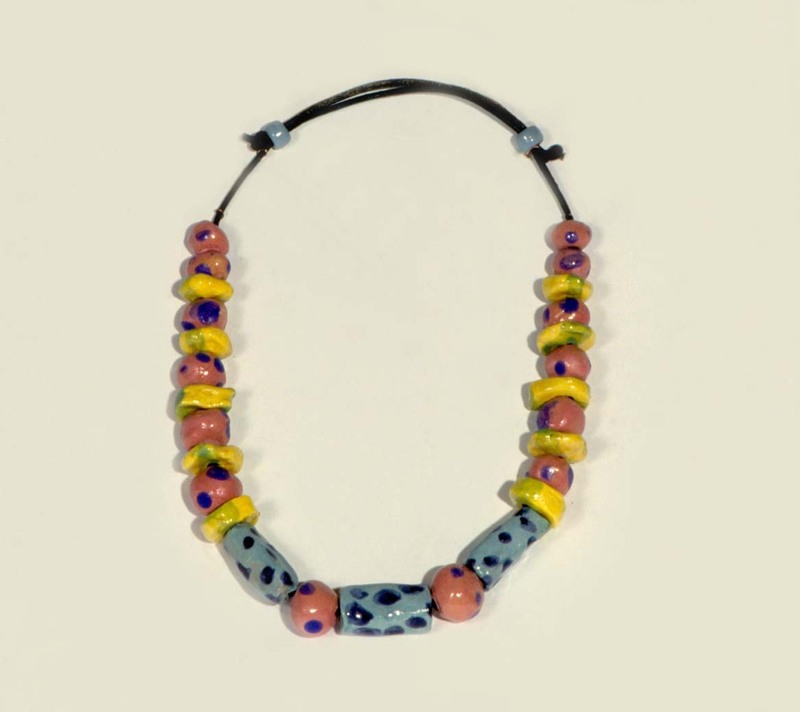 Discuss ways to make balanced designs for the necklaces, such as varying the sizes of the beads next to each other, and repeating colors and patterns evenly on each side. Have the children lay out their arrangement of beads on the work surface before stringing them onto the cord. 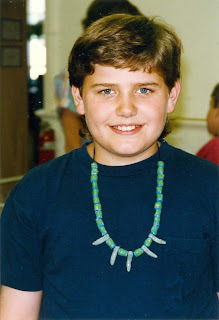 Demonstrate how to complete the necklaces after the beads have been strung on the cords. Slide one plastic bead on each side of the cord. Thread the end from the right side of the cord through the bead on the left side, going through in the opposite direction, and making a knot at the end of the cord. 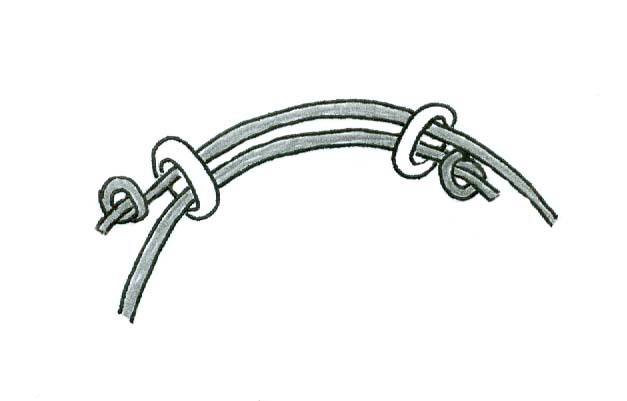 Then thread the end from the left side of the cord through the bead on the right side, going through in the opposite direction and making a knot at the end of the cord. Be sure the knots are large enough so they won’t slip through the beads. 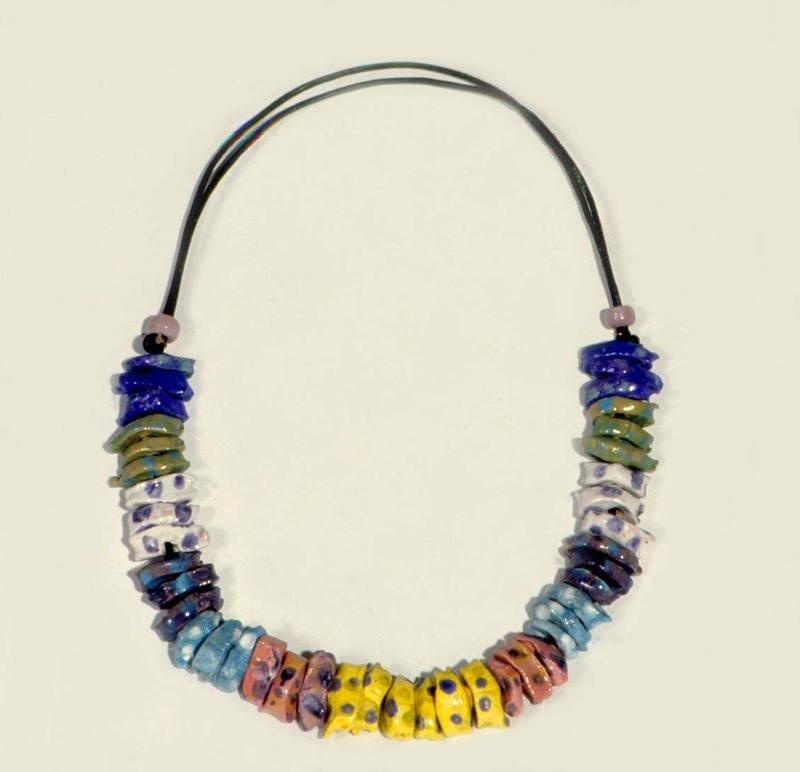 Slide the plastic beads open to fit over the head and then slide back to adjust the length of the necklace. Work along with the children as they make the closures for their necklaces. Antique trading beads which were used as currency in Africa between the 16th and 20th century are excellent examples of the various types of beads that the children will be making in this project. When the beads are bisque-fired they will shrink slightly, so be sure the finishing nails make a hole larger than the wire on the bead rack. 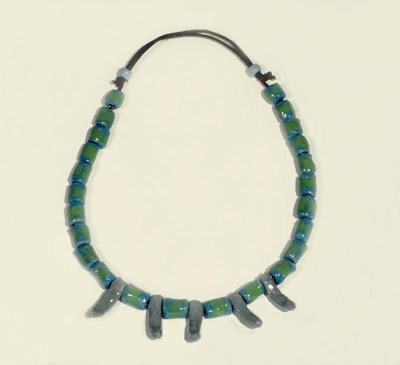 Glazing and firing in the kiln is recommended, but if bead racks are not available, the bisque-fired beads can be painted with acrylic paints, eliminating the need for a fourth session. The clay bowls can be stored and reused by writing numbers on the bottoms instead of names. Then each time the bowls are used, make a list to coordinate each child's name with the numbers on the bowls. To avoid making lots of beads and then discovering that they are too thin for the finishing nail to pass through, have the children make a hole in each bead as it is made. 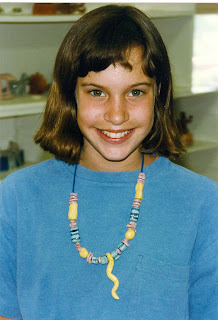 You will need to organize a system to keep each child’s beads separate during the glaze firing. One way is to designate a wire for each child and load the wires alphabetically. To make an adjustable necklace, the double thickness of stringing cord must fit snugly in the hole of the plastic bead. Have the children tell about the themes in their necklaces. Are the beads strung in balanced designs? Discuss how color, shape and pattern were used in the designs. Are these beads the right size? I’m finished with my octopus beads. I can’t think of any more beads to make. My bead broke when I pushed the nail though it. I pushed the nail though the bead in the wrong direction. Now it won’t lay flat. My beads have a lot of extra clay around the holes. I like this bead, but I’m afraid it is too big. A variety of sizes works best, but remember that if the beads are too large, they won’t be comfortable to wear. Test that the bead is not too small by passing the finishing nail through it. 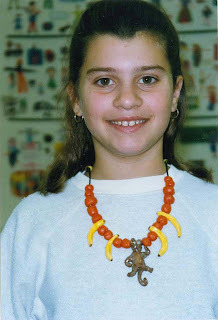 Realistic beads with a theme will stand out nicely if some simple beads are added to the necklace. Be sure to make the holes in the beads as you go along so you won't end up with lots of beads that are too thin for the nail to pass through. If you forgot to make the hole parallel to the flat surface, use some clay to close up the hole and push the nail through again. Carefully brush away the clay left after making the hole in your bead. Try to keep it from falling back into the hole. After the beads are bisque-fired, we will use sandpaper to make the edges smoother. Large beads hang best when placed in the middle of the necklace. You could surround it with smaller beads to make it stand out.